Even with less speed and less glitches than Sonic, Tails is considerably broken. 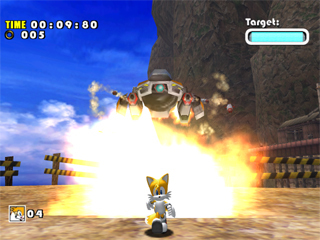 By pushing him into weird geometry places or to small gaps in the level boundary, Tails can easily go out of bounds. This allows me to skip some parts of the game, like taking the Ice Stone to open Ice Cap entrance, as I can simply clip the wall near there and go to Ice Cap. Talking about Ice Cap, this level and Sand Hill were the hardest ones to optimize, because of the snowboard physics. It's hard to keep a straight line while trying to stay on the ground. But when you get it, insane speeds are achieved. And this insane speed allows me to do another super speed trick, which is jumping twice in a ramp. Doing it in the 3rd ramp of Ice Cap with a good angle, you can go outside the level boundaries and go straight to the last section of the level, saving 8 seconds. That one was the trick that saved the greatest amount of time, but there's another one that saved a lot of time: the gravity glitch in Speed Highway. To do it, you have to go to the booster right below the end of the 3 air dashes in the start of the level, and fly from the end of it. If done right, Tails will fly sideways, and by holding up+left in the analog for some frames, you can lock his gravity angle. This allows me to fall straight to the end, literally. By holding B, you start descending, and the longer you hold it, the faster you descend. Starting from power on was the author's choice because it shortens the total Tails time (this movie aims for real time instead of in-game time). So unless the movie aiming to obsolete this one is considered more entertaining, it is not allowed to increase Tails time by starting from a savestate. Moreover, Sonic time must not be longer, if not on purpose. However, if the audience likes the savestate-anchored movie more, despite of being longer, it may obsolete this one.